The genus is Pediastrum. The top photo is normal bright field, while the bottom one is with dark-ground illumination. 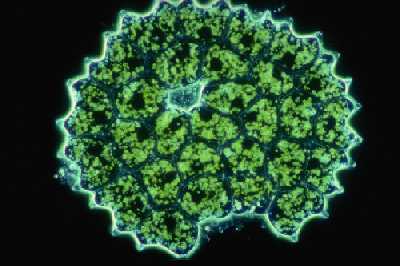 Pediastrum are microscopic (30–200 micrometres in diameter) green plants that are found commonly in ponds and ditches amongst other water plants. As such they are easy to examine using a microscope, because they require no difficult slide preparation techniques. A drop of pond water, covered with a coverslip, containing a little detritus will, more often than not, reveal these disc-shaped algae. 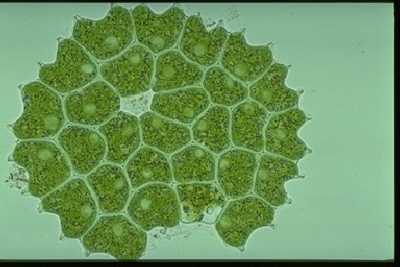 Each plant being 1 cell thick contains between 4–128 cells (depending on species) that are arranged to form a circle or star arrangement. If the individual cells have plane faces, they fit closely together. If they have lobed or wavy surfaces, they produce spaces between them giving an almost net-like appearance. The outer, peripheral cells differ from the others by having one or usually two processes. The two images are of the same specimen using bright field and dark-ground illumination. Each shows various cellular organelles differently. There are about 15–20 different species worldwide.